1. UHF male cable assembly. 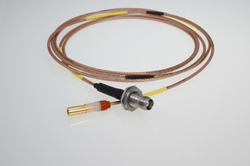 Amphenol Fiber Systems International TFOCA and TFOCA IIÂ® are designed to withstand repeated handing and mating cycles typically required for rapid fiber optic cable deployment and retrieval in a tactical environment. With the proficiency of this field, we are capable to present an extensive range of Right Handed Reducer Cable Tray. In addition, we present these cabins in varied sizes and designs that meet on patron’s demand. This Front Brake Cable Assembly Activa New Model Combi Break is specially designed for active, it gives high performance. Keeping in mind the diverse requirements of the clients, we offer an extensive range of these products. They are durable in nature and are performance oriented. We offer them in varied dimensions and are durable in nature. These products are quality tested and are in adherence with set industrial standards. Experts in the manufacture of custom cable assemblies and wiring harnesses.